I hope you have been up to something good, and not something deceitful, and blue. Eyes are on you during this New Moon in Gemini, beloved. I would like to ask you, do people like what they’re seeing? Do you even like what you’re seeing? Beloved, you are in a state of conflict, possibly even deception and deep sadness. The 6 of Wands coming out as your first card leads me to believe that people are seeing you in a positive light right now. The rest of your reading though, decided to take a turn. The 5 of Swords appearing after your first card can indicate that you are receiving the wrong attention, or attention from the wrong people. You may find yourself on this new moon in a situation you do not want to be in, dealing with people you would rather avoid. During this new moon, and need be the rest of Gemini season, please beloved, take some time to go within yourself. Right now, you may be appearing as a target to people. The only way out of this situation is through building up the courage to leave this predicament behind you forever, Leo. You have reached a point in life where keeping you guard up and your ego up, is only destroying you. So I will ask again. What have you been up to lately? The 4 of Swords is laying in the dead center of your reading. Who or what are you hiding from, beloved? You cannot stay down forever. Nor can you stay in rest position forever. I’m not sure where your light has gone, but this new moon is begging of you to leave and go find it again. I sense that you have not been as happy as you want to be. I believe a pursuit of happiness is in your future. The 6 of Swords calls you to take a leave, perhaps even a vacation, that can bring you to a more peaceful state of mind. The waves are rocky right now, aren’t they? Fear not. When you go on this journey to discover your happiness again, what you will find is your own Strength. Aha! Your card appears as the outcome. Beloved, you are seeking real happiness right now. You miss what it felt like to be in love, to have more vitality, to be inspired and radiant like the sun that you truly are. You owe it to yourself to leave behind anything that is dimming your light these days, or no longer making you happy. The energy card being the 8 of Cups, there is almost an urgency for your to leave something behind in your life right now. Your soul is calling to the sun. You can’t run from this anymore, beloved. Just because people are watching you and you may have had them fooled, doesn’t mean you should continue to deceive yourself by deceiving others. If you aren’t happy in your life right now, the Universe is giving you the green light to leave and figure out what’s missing. 10/10 what you’re looking for is already right within you. Don’t look too far. Don’t travel to too many unfamiliar lands. All you need to tap into right now is your own heart. But if things are too tense and a break is what you need, then please, feel free to get away. Whatever you leave behind on this new moon, has absolutely no place in your life anymore. In fact, various people, ideas, thoughts, and situations may be draining you emotionally and energetically right now. It is in your best interest to let go whatever is hurting or holding you back now, for absolute good. Nobody has a right to dim the light of the sun. Love you more than your need to make others happy. You can’t make anyone happy if you aren’t sunny within yourself, Leo. Better days are coming. But it’s time to make a move. Your go. I wish you happiness and courage. It got lost somewhere inside of you, along the way, but on this new moon, and during Gemini season, you will find it again. 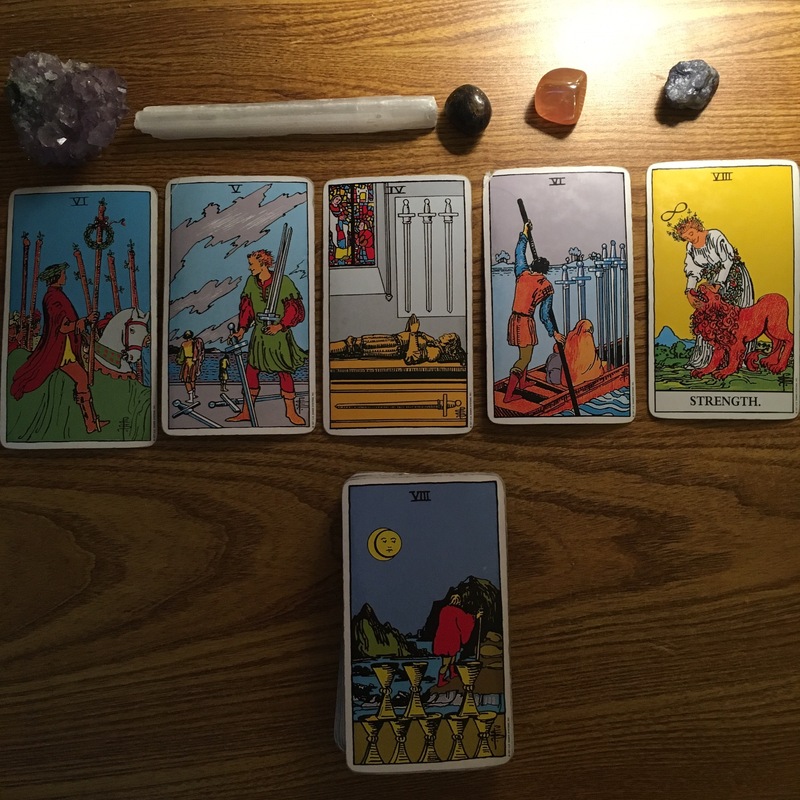 Previous Cancer: New Moon in Gemini Tarot reading, 2017. Hold on to your power and happiness. You can put out ANY fire. Next Welcome to Gemini season! Collective New Moon Tarot reading, 2017. Karmic audits for everyone!